"Integumentary" redirects here; in botany, an integument refers to an outer membrane of an ovule, which develops into the testa, the seed coat. The integumentary system is the organ system that protects the body from various kinds of damage, such as loss of water or abrasion from outside. The system comprises the skin and its appendages (including hair, scales, feathers, hooves, and nails). The integumentary system has a variety of functions; it may serve to waterproof, cushion, and protect the deeper tissues, excrete wastes, and regulate temperature, and is the attachment site for sensory receptors to detect pain, sensation, pressure, and temperature. In most terrestrial vertebrates with significant exposure to sunlight, the integumentary system also provides for vitamin D synthesis. The skin is the largest organ in the body. In humans, it accounts for about 12 to 15 percent of total body weight and covers 1.5-2m2 of surface area. It distinguishes, separates, and protects the organism from its surroundings. Small-bodied invertebrates of aquatic or continually moist habitats respire using the outer layer (integument). This gas exchange system, where gases simply diffuse into and out of the interstitial fluid, is called integumentary exchange. The human skin (integument) is composed of a minimum of two major layers of tissue: the epidermis and dermis. (The hypodermis or subcutaneous layer is not part of the skin.) The epidermis forms the outermost layer, providing the initial barrier to the external environment. Beneath this, the dermis comprises two sections, the papillary and reticular layers, and contains connective tissues, vessels, glands, follicles, hair roots, sensory nerve endings, and muscular tissue. The deepest layer is the hypodermis, which is primarily made up of adipose tissue. Substantial collagen bundles anchor the dermis to the hypodermis in a way that permits most areas of the skin to move freely over the deeper tissue layers. This is the top layer of skin made up of epithelial cells. It does not contain blood vessels. Its main function is protection, absorption of nutrients, and homeostasis. In structure, it consists of a keratinized stratified squamous epithelium comprising four types of cells: keratinocytes, melanocytes, Merkel cells, and Langerhans' cells. The major cell of the epidermis is the keratinocyte, which produces keratin. Keratin is a fibrous protein that aids in protection. Keratin is also a waterproofing protein. Millions of dead keratinocytes rub off daily. The majority of the skin on the body is keratinized. The only skin on the body that is non-keratinized is the lining of skin on the inside of the mouth. Non-keratinized cells allow water to "stay" atop the structure. The protein keratin stiffens epidermal tissue to form fingernails. Nails grow from a thin area called the nail matrix; growth of nails is 1 mm per week on average. The lunula is the crescent-shape area at the base of the nail, this is a lighter color as it mixes with the matrix cells. The dermis is the middle layer of skin, composed of dense irregular connective tissue and areolar connective tissue such as a collagen with elastin arranged in a diffusely bundled and woven pattern. 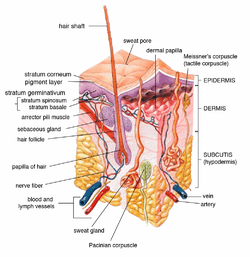 The dermis has two layers. One is the papillary layer which is the superficial layer and consists of the areolar connective tissue. The other is the reticular layer which is the deep layer of the dermis and consists of the dense irregular connective tissue. These layers serve to give elasticity to the integument, allowing stretching and conferring flexibility, while also resisting distortions, wrinkling, and sagging. The dermal layer provides a site for the endings of blood vessels and nerves. Many chromatophores are also stored in this layer, as are the bases of integumental structures such as hair, feathers, and glands. The hypodermis, otherwise known as the subcutaneous layer, is a layer beneath the skin. It invaginates into the dermis and is attached to the latter, immediately above it, by collagen and elastin fibres. It is essentially composed of a type of cell known as adipocytes specialised in accumulating and storing fats. These cells are grouped together in lobules separated by connective tissue. The hypodermis acts as an energy reserve. The fats contained in the adipocytes can be put back into circulation, via the venous route, during intense effort or when there is a lack of energy providing substances, and are then transformed into energy. The hypodermis participates, passively at least, in thermoregulation since fat is a heat insulator. ↑ "The Integumentary System". Encyclopedia.com. Retrieved 3 June 2013. ↑ Marieb, Elaine; Katja Hoehn (2007). Human Anatomy & Physiology (7th ed.). Pearson Benjamin Cummings. p. 142. ↑ Pratt, Rebecca. "Integument". AnatomyOne. Amirsys, Inc. Retrieved 2012-09-28.